As we get closer to the cusp of seasonal change in weather, South India is amidst an active phase of thunderstorms with yesterday seeing heavy rains in many parts of South Interior Karnataka, Rayalaseema & parts of North Tamil Nadu as well. Just like Saturday many parts of Chennai recorded rains yesterday with Ennore Port adding another 4 cms yesterday to the 14 of Saturday making it nearly 18 cms in less than 36 hours considering the rains started around 12:30 AM on Sunday morning. Yesterday the heavier spells of rains went South of Chennai, with places around Chengalpattu, Tiruporur, Kelambakkam seeing the more intense thunderstorms. The IMD observatory at Nungambakkam recorded very light rains with most of the spells missing the core city while airport observatory recorded 8 mm till 5:30 AM today morning. Once again the bulk of the rains for Tamil Nadu happened around Chennai latitude with the most conducive conditions for thunderstorms seen from 13N and to the North of it. With an Upper Air Cyclonic Circulation parked off the coast of Kerala and a North South trough running all the way from North India atmospheric conditions are like a well packed tinderbox over Peninsular India with thunderstorms a question of when rather than if. Once again the best chances are going to be for South Interior Karnataka, Rayalaseema & Coastal Andhra Pradesh with parts of Tamil Nadu falling under the southern parts of the most active thunderstorm zone expected today. Unlike the last couple of days there is a fair possibility of some interior places from the Western districts like Erode / Salem / Coimbatore also seeing isolated moderate to heavy thunderstorms today. 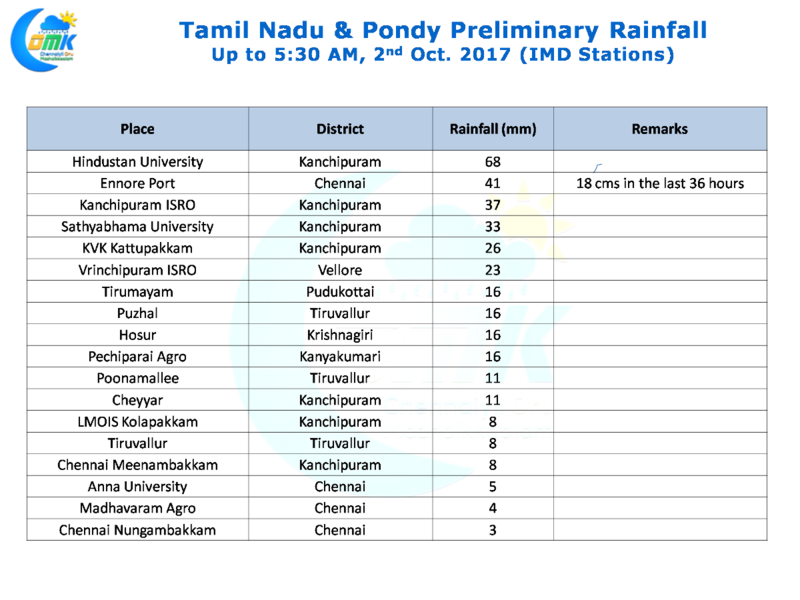 Another active day likely for North Tamil Nadu with possibly Vellore, Tiruvallur, Kanchipuram & Chennai well placed to enjoy some rains.